Rome, Italy – The winners of the first contest in Italy dedicated to reducing the impact of waste and pollution on the sea were announced earlier this week in Rome. The winning startup and the runner-up of the Impact Hub Milano Fellowship on Ocean Cleanup each won a cash prize and support from Impact Hub – the business incubator – in developing and launching their products. The initiative, organized by Impact Hub Milano with WWF under the patronage of Bvlgari, focuses on social and environmental innovation. The idea of encouraging startups addressing the issue of waste recovery from the sea was welcomed by Bvlgari, which in its Sustainable Development strategies is promoting reuse and recycling of resources. They financed the initiative with a grant of €15,000 euros. Gr3n is the winner of the IHM Fellowship € 10,000 prize and a 3-month mentoring program on business planning and prototyping with Impact Hub Milan. They have developed a technology which will increase the amount of recyclable PET from 10% to 100% through a chemical process that ensures that all PET fibers are reusable, while producing zero chemical waste. With Gr3n technology plastic becomes a closed-loop material, just like glass or aluminum, and can be recycled indefinitely. The runner-up wins a € 5,000 prize as well as support from Impact Hub Milano: they are SEADS – Sea Defense Solution – a young company that aims to tackle marine pollution by installing barriers in rivers, redirecting waste to a catchment area where it accumulates before being collected and sent for recycling. The SEADS project has significant implications for the prevention of ocean pollution. Giuseppe Di Carlo, Director of the WWF Mediterranean Marine Initiative, Marco Nannini, Managing Director of Impact Hub Milano and Eleonora Rizzuto, Bvlgari’s Director of Sustainable Development, took part in the award ceremony. "Plastic at sea is a real global emergency: according to the latest data at least 8 million tonnes of plastic end up in the world’s oceans every year. The repercussions on the environment, in terms of pollution and contamination of the food chain, affect everyone in every corner of the planet. Consumers, companies, investors and researchers must find solutions that minimize the production, use and waste of this material. With this initiative WWF will contribute to a more circular economy and innovation. We hope that the two winning projects succeed in the market and stimulate other innovative ideas." "We have an ever-increasing need to rethink our supply chains and production processes to ensure responsible and sustainable use of resources with maximum respect for the environment. Bvlgari has accepted the challenge of sustainability and is implementing important programs with a view to a circular economy. We hope that thanks to this contest, which we have sponsored, start-ups will have a greater chance to develop their solutions towards preserving marine ecosystem, while creating opportunities for economic development and recovery and reuse of material." 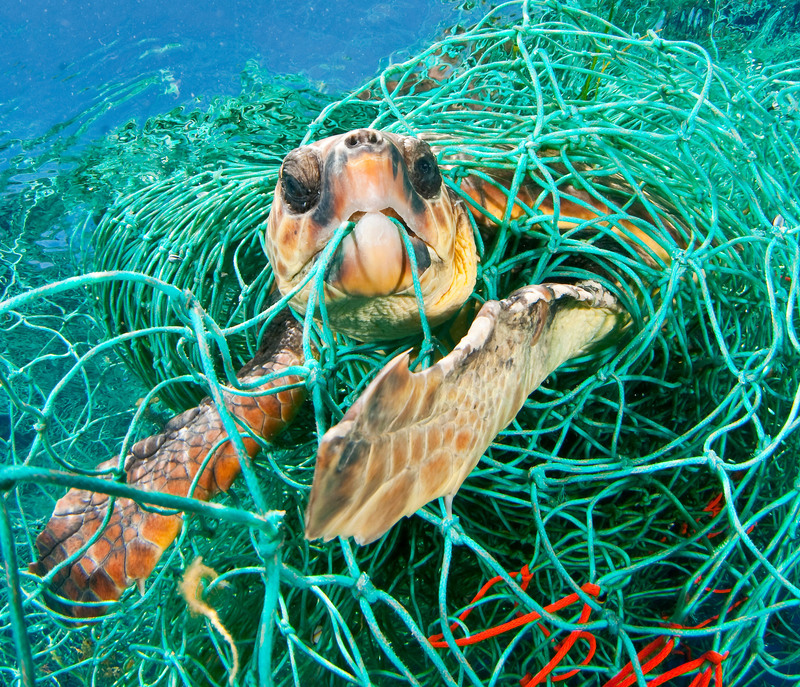 Loggerhead turtle (Caretta caretta) trapped in a drifting abandoned net, Mediterranean Sea.